Every landlord should take measures to protect their belongings and the possessions of their renters. The information below will be helpful for every renter. In partnership with TenantCloud, Assurant offers a single, low-cost policy that covers a tenant's personal belongings and liability. 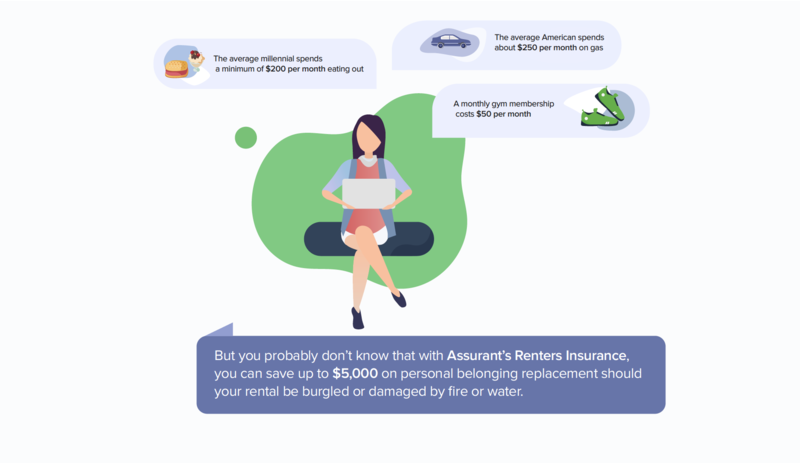 Assurant is the leading provider of renters insurance programs, offering financial protection for unfortunate situations a person cannot predict and finding solutions for unfavorable circumstances people face. Assurant's Renters Insurance protects your personal belongings. Assurant's Renters Insurance will reimburse you the cost of the item damaged/stolen by any peril above. So you can buy as many clothes as you want or spend half your monthly income on a gym membership while renters insurance takes care of your property and guarantees $30,000 of personal property coverage. Assurant's Renters Insurance covers your personal liability. You're a lucky renter if your guests or neighbors haven't been injured at least once in your apartment or yard (for instance, slipping on a wet floor or sustaining a pet-inflicted bite). Unfortunately, accidents happen, and people are likely to require compensation or ask you to pay medical bills, if necessary. Luckily, Assurant's Renters Insurance provides $100,000 of liability coverage, protects you from lawsuits, and allows your landlord to sleep well at night. With renters insurance you don't have to worry about replacement costs. Brand new TV stolen? That's sad news, but renters insurance covers replacement costs, so you can get a new device in a heartbeat. This isn't just about your belongings, though. Renters insurance also gives you peace of mind when it comes to burglary. To reduce financial risks, consider purchasing renters insurance since, according to recent data, a burglary takes place every eighteen seconds in the U.S. It's less expensive than you thought. Depending on the state and the coverage, renters insurance prices start from $16/mo, i.e., $192 per year. Taking into account the fact that an average American spends approximately $80 a month on coffee, $192 a year for personal property protection seems pretty reasonable. Would you rather get another cup of coffee in the local coffee shop or invest in renters insurance and protect your home coffee maker? Once you've been moved in, you'll see the rental in your TC account. The "purchase the insurance" tab will lead you to the policy page where you can get a quote or enter the required information if you already have renters insurance. Then you'll need to provide additional information, enter the policy effective date (the date you want your coverage to begin), and provide payment.